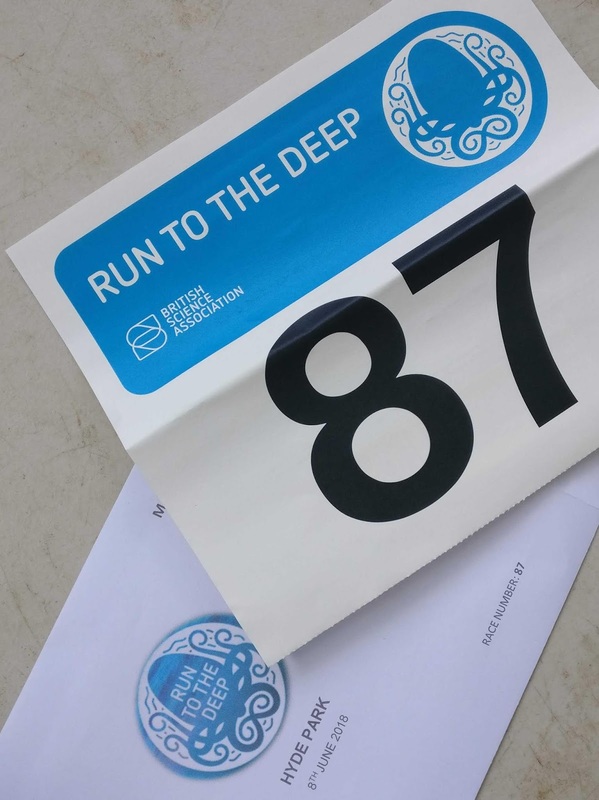 Run To The Deep was a last minute sign up. There had been an email to the run club at work but I totally forgot about it. The reminder email (with a photo of the octopus medal) was just the nudge I needed to register. Put on by the British Science Association, who smartly hired The Race Organizer to execute the race, it was a lovely Friday evening run around Hyde Park. The weather was perfect for running- just a bit cool with a slight breeze. About 200 people came out, although the race could have allowed 500 runners to take part. Race entry and fees: Registration was £25 through Eventbrite. You could also register on the day. Rather than mailing out the race packets, we had on hour before the race started where we coud collect our bibs at the start line. I got there 30 minutes early so had time to say hi to some friends (a pleasant surpise to see them!) and warm up. Course and bogs: The course was a 5 km loop through Hyde Park that you had to do twice. It was really well marshalled with a person in high-vis at every turn cheering us on, as well as large bright signs. There weren't any mile markers so I was glad I had my Fitbit on to help me keep track of my distance. The paths were open to the public but it wasn't too crowded. Park toilets, which normally cost 20p but for some reason were free that night, were right across from the start line and there was never a queue. The water station was at the start line, rather than out mid-course, and sufficient in size for the weather, number of people and course length. If you have been living under a rock, you may not have heard about how much plastic rubbish ends up in the ocean. The Run To The Deep organizers made a few simple decisons to help reduce the amount of plastic produced by the race. The water cups were biodegradable and compostable. The water itself was brought in in large carboys rather than small water bottles you would get at a store. 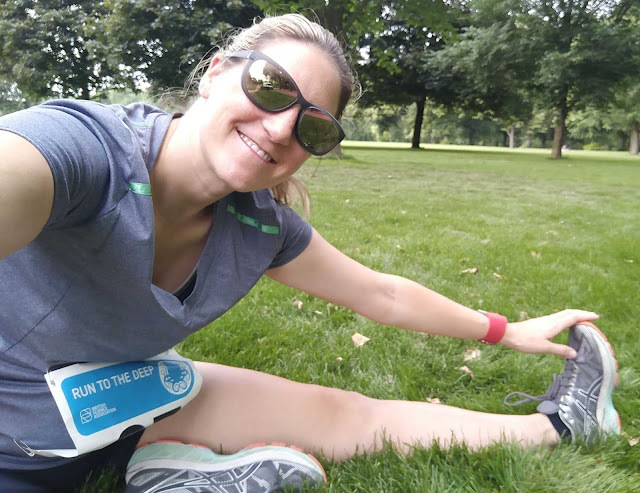 Location: As I have mentioned, the race was in Hyde Park, London, after work on a Friday evening. It was really easy to get to. I actually took a bus over from Oxford Circus. I don't make it over there too often so it was nice to see a different part of London. The park is the largest of the four Royal Parks, so it was fairly peaceful in terms of traffic noise and not very crowded with people. I imagine if it was a wee bit warmer, the park would have been more crowded. The course took us by the Serpentine too. I had to stop and take a picture. You don't see this on city runs very often. 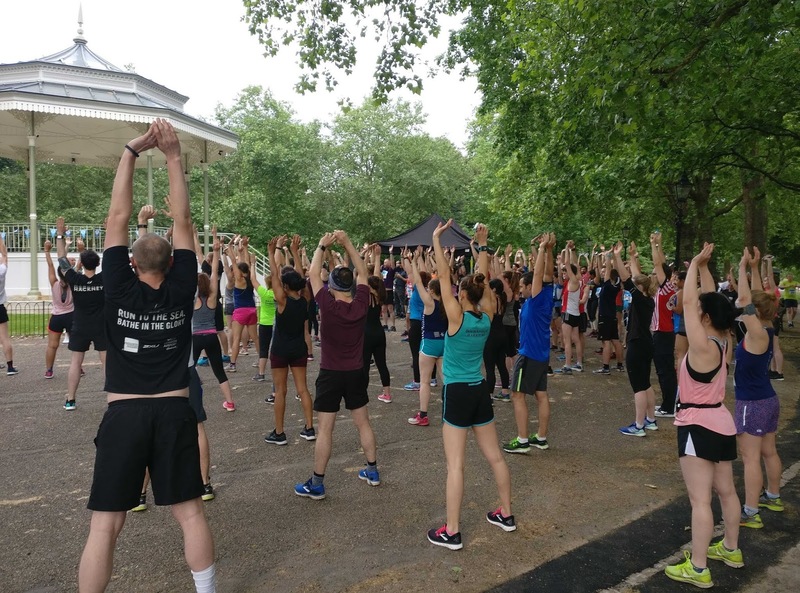 Atmosphere: With only 200 runners in a very large park, there wasn't much atmosphere in terms of cheering or running alongside other people. One of the cool aspects of the race was the Run To The Deep app that used GPS to narrate your trip to the bottom of the ocean. 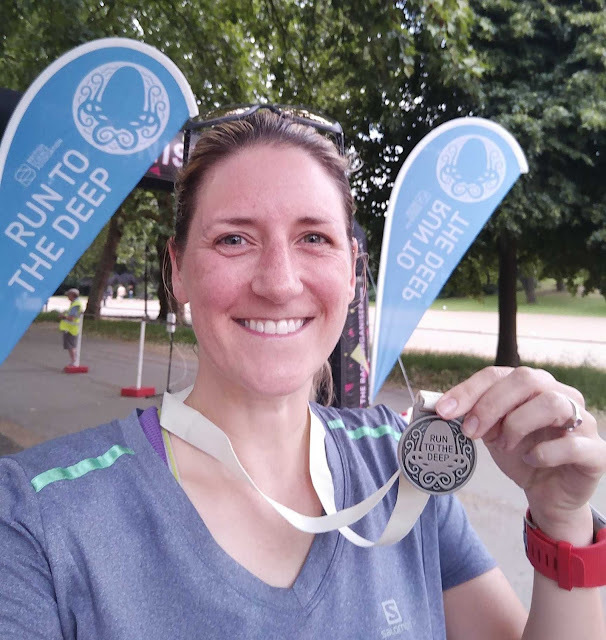 It was really strange to run a race that encouraged you to wear headphones, especially where there were so many scientists together in a semi-social setting (well, I went because I am a scientist but I am sure some people were not). I opted to enjoy running in the park rather than listening to the app. My friends who used the app said it was pretty cool so I need to download it asap and give it a try. 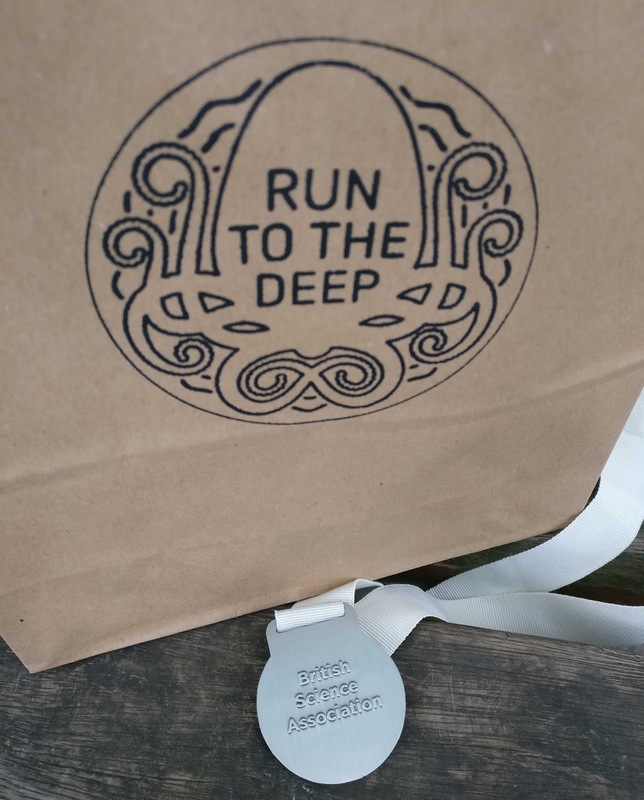 Race bling and goody bags: The race medal design was what convinced me to do the race. There is an octopus on it and I am a marine biologist by training. Therefore, it was a no-brainer. Another eco-friednly choise was using a ribbon that was 100% cotton so it didn't contain any plastic. Hurray! The paper goody bags contained the medal, a banana (no wrapper!) and a collapsible stainless steel cup on a key chain (#genius). That is going in my camping gear as I always carry a resusable water bottle with me anyways. Tips if you want to take part next time: If you had been listening to the app, you would know how far you have gone along the route. If you run without the app, I would suggest having a running app or watch to let you know the distance covered. As I mentioned above, I was keeping tabs of my mile splits with my Fitbit so this wasn't an issue for me. Make sure you bring a few 20p coins in case you have to use the loo.